Why does a camera perceive depth-of-field when pointed at a mirror, it's basically a flat piece of glass? In principle, how is photographing a painting mounted behind glass different to photographing a reflection in a mirror, in so far as depth-of-field is concerned? A perfect plane mirror reflects light in such a way that the reflection is indistinguishable from a real object sitting at the apparent (reflected) position. All of the light waves / rays arrive at the camera in just the same way, so there is no difference in DOF, diffraction, etc. between a real object and the virtual object created by the reflection. In other words the mirror isn't just "a flat piece of glass", it's actually an ultra-high-tech space warping device that makes two regions of space equivalent as far as the light arriving at the camera is concerned. I'm thinking that the mirror is a device for translating coordinate systems, but there is still more to it, as reversing left and right. Look into a mirror, at 45 degrees, and the image appears to be in a different place in 3 space, with your position being the reference. It's amazing how complex you can make a thing that we all take for granted. It's amazing how complex you can make a thing that we all take for granted. Yeah, mirrors are hard to think about. I'm thinking that the mirror is a device for translating coordinate systems, but there is still more to it, as reversing left and right. Except really it isn't even "left and right", or at least not always. If you hold a bouquet in front of yourself and look at it in the mirror, then what is on your left side of the real bouquet is also on your left side of the reflection. In this case what is reversed is really "front versus back" -- and along with it our concept of handedness. On the other hand if you hold the mirror vertical and almost parallel to your line of sight, and look at a distant bouquet and its reflection, then what is on your left side of the bouquet will appear on your right side of the reflection. So in that case it is left/right that's being reversed. Now rotate the mirror downward so that it's like a pool of water with the reflection appearing below the real bouquet, and (good grief!) what's on your left side of the real bouquet is again on your left side of the reflection. Suddenly it's up/down that has been reversed. The unifying concept is that the mirror reverses the coordinate that is perpendicular to the plane of the mirror. When the mirror is perpendicular to your line of sight, that means front/back. When the mirror is vertical at a glancing angle, it means left/right, and when the mirror is horizontal at a glancing angle, it means up/down. Set the mirror at any other angle, and the reversal still happens along the perpendicular axis. And of course reversing any one coordinate changes the handedness of the coordinate system, so the mirror always does that. With this explanation in hand, I have to wonder... Is the mirror itself really so hard to understand, or is the problem that we keep trying to use inappropriate models to describe it? to further confuse and confound before offering a simpler explanation, teasing person that I am. A looking-glass or speculum; any glass or polished substance that forms images by the reflection of rays of light. Does the speed of light play a part in forming such 'reflections' with respect to depth-of-field? The simplest methods of ray tracing can solve it explicitly....or, can they? Indeed they can, for some definition of "they". The methods work fine when properly applied. Applying them properly, well, that's a different problem! Questions that start "Does the speed of light play a part..." are always tricky. Maybe a good answer is "Uh, sure, but in this case you don't need to think about speed of light to get correct answers. In fact it's probably easier if you don't." If you just take the usual ray propagation model and throw in "angle of incidence equals angle of reflection" at the mirror's surface, then you get a very nice model of the whole system. If you know you're working entirely with the reflection, then a simple model is that the mirror just inverts the space around it. Whatever is in front just moves to the same distance behind. This immediately tells you that the mirror is not going to introduce any aberrations, an issue that would be difficult to figure out by detailed ray tracing. It's difficult to explain in words, but a mirror does not reverse left/right. When you hold a paper with a word written on it, it appears backwards because . . . you flipped it backwards when showing it to the mirror and it reflected the exact image back to you. Write a word on a transparent sheet of plastic and you'll see that the backward object is reflected as a backward image. Usually, the next question is, "Then why do they write the word "ambulance" backward on the front of the ambulance? Isn't it because the mirror flips it and then you read it normally?" No, it's because you have your back to it when you read it in a mirror, so YOUR left and right are reversed, not the mirror's. When you turn around, the word goes from your left to your right just as it's supposed to. A mirror is incapable of flipping anything. It simply reflects light rays back out the opposite of the way that they came in (angle of incidence = angle of reflection). The reason that a human appears to be left/right flipped in a mirror is due to psychology, not physics. I am bothered by the phrase "due to psychology, not physics". If you view simultaneously any 3D object and its reflection, and apply any objective analysis you want to the resulting views, the analysis will conclude that the two imaged 3D "objects" are flips of each other. That's true even if the analysis is done entirely by computer -- no human involved, hence no psychology. The object and its reflection simply cannot be superimposed on each other by any combination of shift & rotate. That's a clever and thought-provoking demonstration provided in the link, using a transparent 2D sheet versus an opaque T-shirt. But the explanation may be misleading. It's true that the left/right reversal is due to a switch of reference frames, and the particular choice of reference frames is a matter of psychology. But the fact that the mirror introduces some flip is physics, not psychology. I respectfully disagree. Draw a ray diagram of an object reflecting off of a plane mirror. There is no flipping whatsoever. It is psychology because our brain assumes that if the eyes are facing us, then the hand on our left is the reflection's right hand. But it's not. It is being reflected directly straight back how it came in and the brain is translating it as a reversal. Put a piece of cardboard right down the middle of your body to the mirror and close your right eye. Move your left arm and your brain will still tell you that it was your image's right arm. With the cardboard in the way, it is IMPOSSIBLE that the mirror flipped the image. It was the amazing human brain that did it. Maybe I should have said "brain" instead of "psychology." If you poke your left eye in the mirror, your reflection pokes the same eye, your brain just assumes that it's a person facing you and translates it as the right eye. If you stand up, the mirror flips left/right. If you lay horizontal, it flips up/down, hence, it is the orientation of the human head that affects the flip, not the mirror. I agree it's difficult to explain in words, and drawings are so hard to get right. Perhaps this photograph will illustrate my point. 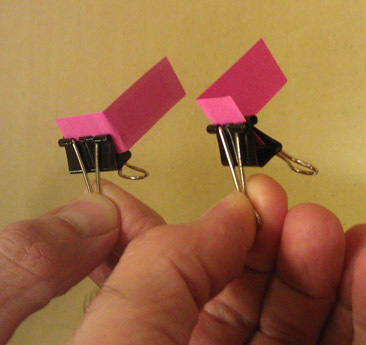 What we have here is clearly two hands holding two binder clips, each clasping its own piece of pink paper. As an exercise in mental gymnastics, try to find some combination of 2D and 3D rotations and translations that will bring the left clip and its paper into correspondence with the right clip and its paper. Hint: there isn't one. The two clip-and-paper assemblies are carefully constructed so they cannot be placed in correspondence, by building one of them in a coordinate system that was a "flip" of the other. But of course I'm lying. There's only one physical clip. The other one is an image created by a flat mirror. What you're seeing is just a simple snapshot of an object and its reflection. So I pose the question: if a mirror "is incapable of flipping anything", then why can't the reflected clip be superimposed on the physical clip? Look into a mirror, at 45 degrees, and the image appears to be in a different place in 3 space, with your position being the reference. This is commonly used in films/TV, to show the reflection of an actor's face in a mirror when, in reality, the actor is standing to one side with their body facing the wall on the far side of the mirror. The actor's face is turned towards the mirror and the camera lens is pointed at the mirror from something like 45 degrees to its perpendicular. a) Because we don't have the mirror to help us. We have one real image instead of a real one plus a virtual one. b) The image is not a hologram so we don't have enough information about hidden parts of the clips or hands. We have one real image instead of a real one plus a virtual one. True, but you're assuming knowledge of what is real and what is virtual. If the mirror is perfect, and I don't let you touch anything, then you can't tell which light rays are coming straight from a real object and which light rays have bounced off a mirror instead. So the mirror essentially creates a virtual object. What we're now considering is the relationship between the real object and its virtual twin. The light rays coming from the real object will of course be consistent with the real object. The ones coming from its reflection will be consistent with a "flip" of the real object. So from the standpoint of the camera receiving the light rays, the mirror has created a new (virtual) object that is a flip of the original (real) one. This is the sense in which the mirror flips something. As I explained earlier, one short way to understand what the mirror does is to imagine that it flips space across the mirror's surface. Every point on the real object is related to the corresponding point on the virtual object by a line that is perpendicular to the mirror and is just as long in back of the mirror as in front. In other words, the mirror simply flips distance with respect to itself. This is physics. How you choose to interpret the flip is psychology. Most people say that a mirror flips left and right, based on their imagined change of viewpoint. That's not correct, or at least not very precise, as discussed earlier in this thread. However, it is correct to say that the mirror flips handedness, in the sense of left-handed and right-handed coordinate systems. The reflection of a right hand looks like a left hand, and vice versa, and similarly for any other asymmetric object like my binder clip and paper flag. If your actor has a scar on his right cheek, then your actor's reflection will have one on his left cheek. I have always found that this difference between the human eye and the camera very inspiring. When I started my 'carreer' as an 'artist' I tried to create images that show this difference. I'll post an image I made more than 20 years ago that you may find interesting. I only did black and white photography and there was no photoshop during those days. It was all darkroom techniques. It is a bit of a trick photograph but is interesting because photography enables us to be at 2 places at the same time. At that time I also started doing stereo photography. There is one image, (I don't have a scan here where I place 3 mirrors on a mantle piece and I rotated each mirror a bit so they looked like 3 similar images. I made a 2D and a 3D image. In the 2D image it looked like 3 photographs and in the 3D you saw that they were mirrors. Mirrors are realy strange in 3D pictures so I used these a lot. Anyway. it is fun to focus on what is special about photography. 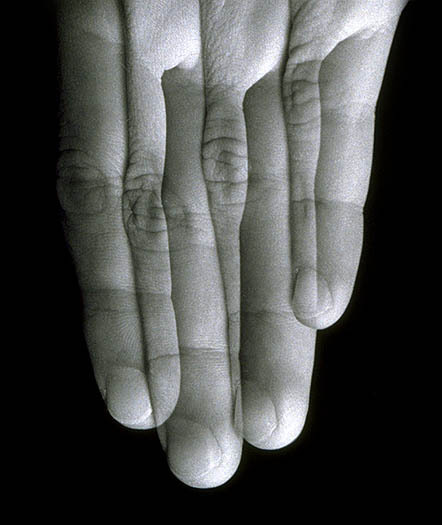 I hope you don't mind that I post this image becasue it does not belong in a microscopy forum. My appologies! But for me starting using microscopy was a logical step in trying to use the camera to enhance our human perception. And being an 'artist' I aso liked the strange abstract microworld. While in the beginning I did a lot of effort to transform reality to create an abstract image I could now work as a true realist but the results were much more abstract than I could ever image.